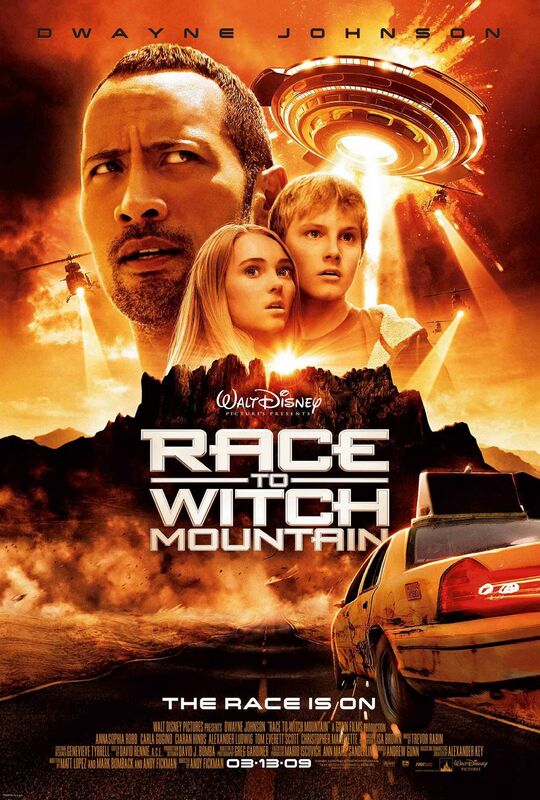 Movie: "Race to Witch Mountain"
A Las Vegas cab driver named Jack Bruno (Dwayne 'The Rock' Johnson) picks up two teenage passengers, a brother and sister named Seth (Alexander Ludwig) and Sara (AnnaSophia Robb). Unbeknownst to Jack, this brother and sister are actually aliens with supernatural powers who are being pursued by the federal government, who want to capture them for research. Now, Jack, with the help of UFO expert Dr. Alex Friedman (Carla "I only work with 'The Rock' Gugino) must get them back to their ship so they can return home with research that could save the planet. "Race to Witch Mountain" is a remake of the 1975 Disney science fiction family adventure "Escape to Witch Mountain." Andy Fickman directs and puts his spin on the old story, taking full advantage of new special effects technology to create what he believed was an imaginative, fun tale. It stars Dwayne 'The Rock' Johnson as Jack Bruno, a Las Vegas cab driver and former wheel-man for a local mobster. Jack has been trying to stay clean and on the straight and narrow, but the mob wants him back as their driver and aren't afraid to rough him up to get what they want. This little subplot exists to help explain Jack's driving abilities within the context of the story. After Jack randomly sees Sara and Seth, a brother and sister alien duo played by AnnaSophia Robb and Alexander Ludwig, in the back of his cab, and because of an altercation that had just occurred with his former mob employers, Jack is under the perception that his ex-buddies are chasing his cab for him, not for the passengers inside his vehicle. Other than that, this plot doesn't serve much purpose and doesn't ever come back again. One thing you will consistently see in our reviews for movies featuring Dwayne Johnson is our acknowledgement that, with anyone else filling his role, most of the movies he's in would fall flat on their face. This has to do with Johnson's charisma and likability. Johnson might be hit or miss as an actor, but you cannot deny his endless charm and screen presence, which makes his movies much more palatable. He does a good job as Jack Bruno. Ludwig and Robb are both good in their parts as well, attempting to play monotonic aliens who take everything literally. The main plot revolves around the aforementioned passengers, Seth and Sara. These alien siblings have supernatural powers. It's with these powers where new CGI technology comes heavily into play. Sara is telekinetic and can moves things with her mind, which comes in handy as Jack tries to escape one too many times from perilous situations. She is also telepathic. Seth can change his molecular density, and because of this, this character is on the receiving end of a lot of goofy looking CGI work. Sometimes, these effects look good, but most of the time, they look a little cartoonish. When considering this "new" CGI is only about 7 years old, it's crazy how outdated it looks. The sets, even more so than the effects, look the most fake. It is painfully obvious when scenes are show on a set rather than on location. One scene in particular involves our three protagonists running through a tree-lined jungle. We haven't seen trees look so fake since the days when cars were put in front of moving backgrounds and actors were instructed to look like they were driving in an inoperable or not moving car. "Race to Witch Mountain" is a moderately fun movie with a few exciting moments, but the overall narrative feels pretty clunky. There are some humorous moments, but most of the humor is mundane in nature. Also, there are a couple of little awkward and corny lines, usually delivered by our alien protagonists, but they are good for a chuckle. This is about as "kid movie" as you can get, and some adults might find its Wonder Bread qualities boring and lame. For such an exciting sounding premise, it is a pretty stagnant letdown. One year ago, we were watching: "Maggie"